Trained in the art shaped curved trunk style, the 'streibs findling' is a vigorous evergreen tree with abundant decorative red fruits in fall. This tree matures at a lower height and has smaller leaves than other species. Its semi-glossy foliage is accompanied with tiny white flowers in late spring. The branches fill with red berries during fall and foliage takes on a purplish tint by winter. Keep outdoors. 7 years old, 11" tall. 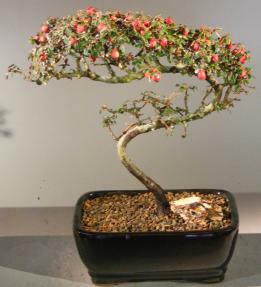 Recommended outdoor evergreen bonsai tree, grown and trained by Bonsai Boy.